The official magazine of the hit TV series, Grand Designs Magazine is inspirational, intelligent and innovative. It is an essential magazine for anyone undertaking a house project, no matter the scale. Grand Designs is the UK’s most watched property programme on TV and the magazine continues the theme, providing the best examples of clever residential architecture and design. Order your Grand Designs Magazine subscription today and get access to the freshest TV house exclusives, designs and interiors, giving you all the inspiration you need to get your next project off the ground. 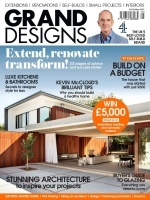 Read Kevin McCloud’s latest news and opinions, get fantastic project ideas and essential expert advice. With your subscription you will also receive free live show tickets and six supplements on key design topics throughout the year. Extend, renovate, transform – 212 pages of advice and success stories… Build on a budget – the house that was started with just £500… Kevin McCloud’s brilliant tips – why you should build a healthy home… Luxe kitchens and bathrooms – secrets to designer style for less… Buyer’s guide to glazing – everything you need to know… The £270,000 treehouse – take your ideas from this low-cost project… Modern kitchen extensions – boost space and add value… Eco-chic living – how open-plan features can work for you… Striking exterior finishes – the essential guide to cladding… High tech digital bathrooms – use less energy and save money… The top-ten self build secrets you need to know.. Order your Grand Designs Magazine subscription today and find out why it’s the UK’s best loved self-build magazine. Who Reads Grand Designs Magazine? Readers are affluent, design-savvy professionals who are looking for some inspiration for their next home project.